Bring milk up to 110 degrees F. Here's where many recommend you first bring it up to 180 F to pasteurize (That is up to you and your researched decision. ), then cool to 110 F (warm to the wrist, not hot). Mix ½ cup organic yogurt with 1 cup of the warm milk, then pour the mixture into the rest of the milk, mixing well. If you want to make vanilla yogurt, now is the time to add 2 T homemade vanilla extract. 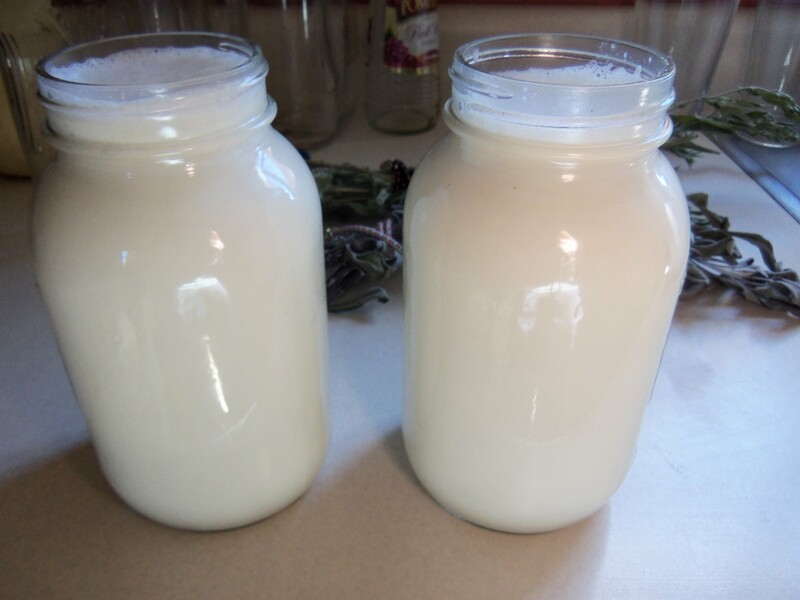 Pour milk into sanitized jars and put lids on loosely. Keep at 110 F for 6 hours without mixing, stirring, or moving if possible. Put in a yogurt maker that keeps them at 110F. Put the jars in water that is 110 F and wrap towels around it to keep warm. I've done this before and it stays warm for a very long time. You just need to check occasionally and turn the burner on for a minute or two (but watch carefully). Bring milk up to 110 degrees F. Here’s where many recommend you first bring it up to 180 F to pasteurize (That is up to you and your researched decision. ), then cool to 110 F (warm to the wrist, not hot). 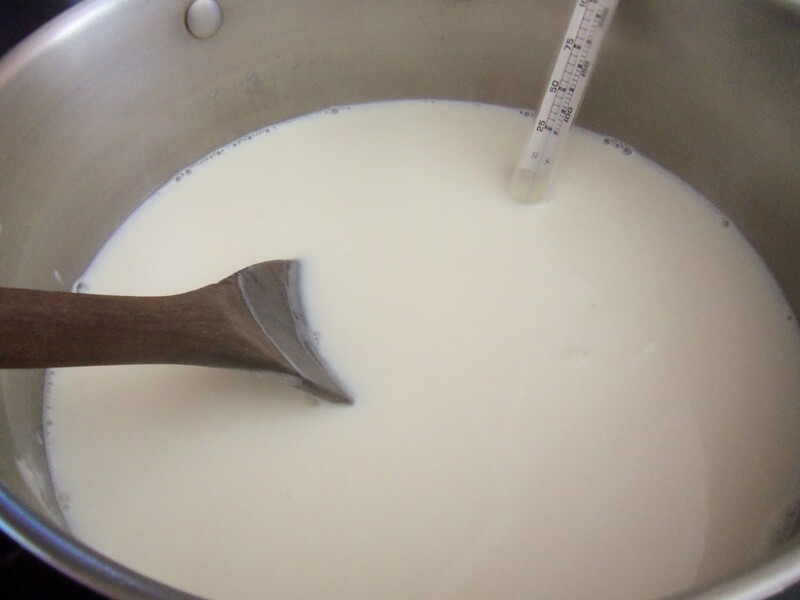 Mix 1/2 cup organic yogurt with 1 cup of the warm milk, then pour the mixture into the rest of the milk, mixing well. Put the jars in water that is 110 F and wrap towels around it to keep warm. I’ve done this before and it stays warm for a very long time. You just need to check occasionally and turn the burner on for a minute or two (but watch carefully). Put in oven and place candy thermometer so you can see temp.This usually stays at 110F for about 4 of the 6 hours. If you turn the oven on, again, watch it carefully. You can turn the oven light on and it may keep it at 110F as well. We make homemade yogurt too. I put the jars and 110 degree water inside a hard-sided cooler (i.e. Igloo brand) and let it set overnight. It comes out perfectly. Ok, I made 4 quart jars at the same time. 2 separated, I’m guessing they got too hot? 2 were too runny. any suggestions? There’s going to be some whey on the top, but I’m guessing that’s not what you mean ny separated. If you moved them or stirred them they will often be chunky or runny. If the temp. gets too high it will kill the bacteria you want to grow. Also, some starters are not as good as others….My first one was like that, but they’ve all worked since then so don’t give up. Without knowing more I can’t be much more help. Sorry. I make my own yogurt with raw milk and only heat it to 140 degrees in a crockpot to keep the yogurt raw. I put it in my electric oven that I pre- heat to 170 and then put the crockpot in the oven turn off the oven and it ferments really well. Thanks for sharing on Real Food Fridays Blog Hop! There are lots of ways to make yogurt. My system is to use a starter which is a mix of two commercial yogurts (Trader Joe’s European Style Plain and Ömür/Omur plain), start with a bit less than a quart of nonfat milk, add enough dry milk to make a cup of milk, heat to 190F or so, let cool to 52C/126F, add about two tablespoons of starter, and place in an insulated container for roughly 48 hours. The two components of the starter have about half a dozen different bacteria between them. A long time ago I discovered by trial and error that the 52C starting temperature worked well for me. The addition of the dry milk enriches the yogurt, making it firmer. The Omur by itself as a starter makes the yogurt too ropy; the TJ’s by itself makes it sort of soupy; the taste is fine with either alone. The blend creates a fairly firm yogurt, at least with my starting temp, slow cool-down, and long time before refrigeration. The two-day ferment makes it fairly tart, which I like. I use the yogurt on breakfast cereal (homemade granola) and in some recipes, and go through three or four quarts a month. Homemade yogurt is delicious. I have made it before with warm water inside a cooler. Works wells and you can just forget about it until it;s done. I’ve done that as well. After getting it to the perfect temperature, I wrapped mine in towels in the cooler and didn’t touch until set. Easy! !